This 3,000 word photoessay on Occupy Wall Street depicts Friday morning’s events at Zuccotti Park, shortly before the threatened cleanup, and the march on Wall Street that followed. They were saying on Thursday night that it was all over for the protesters. 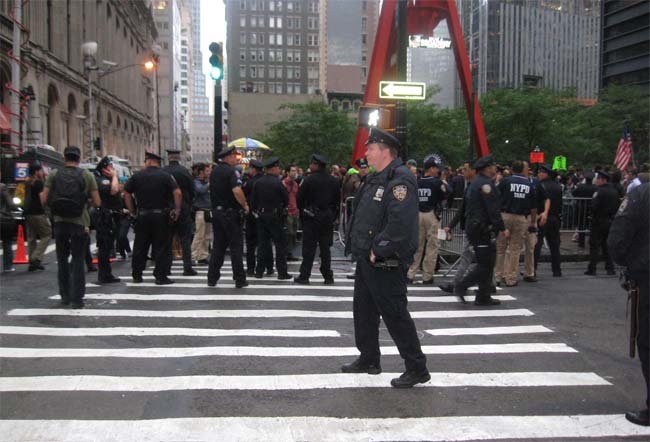 Brookfield Properties, the owner of Zuccotti Park, had asked the NYPD to uproot the people who had been occupying their park. Mayor Bloomberg had said it would be clean on Friday morning at 7 AM. And there were petitions and pleas and hues and cries. Just after midnight, I was paying attention to the cracks of thunder and the white lightning flashes and the hard rain rapping against the pane of my window in Brooklyn. I was reading reports of protesters shouting with joy against the heavens. They didn’t give a damn if they were being doused. Yet I fretted hard about the whole scene and couldn’t sleep and hit the subway station less than two hours after these ruminations, hitting the subway station close to the golden palindromic time of 2:22 AM. While waiting for the train, I listened to a thin middle-aged man loosen his incoherent rap addressed to our present President from some semblance of a Black Power haze, conflating a CIA conspiracy to flood drugs into poor neighborhoods with an anti-Semitic plot involving 9/11. His umbrella nib stabbed through the air with each improvised line. In ten or fifteen years, could this be an Occupy Wall Street protester? Not out of the question. A little more than a week before, I went to Zuccotti and the surrounding areas after the Foley Square arrests. The open talk had transmuted into something more quiet and cautious after mikes caught quite a lot but sullied the message. There had been talk of interlopers and intruders and betrayers. And while hardly an expert in American politics, I knew my history, remembering how it had all fizzled out in the years before my existence. The thin middle-aged man gave me an opportunity for more sentimental equations, and I couldn’t shake my heart’s troubling tendency to play the long game. When I hit Zuccotti on a very early Friday morning, the park was more pristine than I expected. The protesters were determined to keep it clean. The trash was neatly packed in careful sheaths. I observed a plastic lid on the ground, then watched as it was scooped up by a stray hand a mere thirty seconds later. Such stunning efficiency reminded me of Disneyland’s garbage policy. The mood was more sanguine than the previous week. Two vehicles, circling round and round and round the park, were capturing images. I was certain that my face was now in a database. It was a little before four. The TV news vans were mostly parked on the other side of Cedar. Their insides were dark, still as coffins. I looked above at the mannequins in a Men’s Wearhouse, their dead forms serving as sentries for the lively sea I was swimming in. Then I watched a man in a Santa Claus suit sweeping the curb. Thinking of the approaching winter, I wondered if this morning cleanup, this last moment of dignity, was the end of the movement. I walked around, didn’t see any apparent plan for seven that morning. One sanitation car, one garbage truck. If the authorities had something up their sleeves, it was as unplanned as lint in a belly button. Not long before, Bill O’Reilly had called the Occupy Wall Street protesters “drug-trafficking crackheads.” But the only smells in the air were cigarettes and incense and the fresh urban aura that settles in just after a storm. Narcotics? The only person who came close was a Wikileaks reporter making a pleasant show about cadging a cancer stick. And who can blame him? He was one of the few reporters the protesters trusted, probably because most of the media had dead opportunism in their incurious gazes. I watched a dark-haired radio reporter in his early thirties, a dutiful employee wearing a tie, talk with a man who had been fired in 2009, a man who was trying to explain why he and his fellow protesters were there. The reporter quoted some circuit case, but it was his eyes that unsettled me. They were more concerned with winning rather than listening, perfunctory as a man trapped in a weekend escrow seminar. It was difficult to ignore the media presence. As more reporters settled around Zuccotti’s perimeter, with few of them wishing to enter the square, the scene resembled some Mephistophelean metaphor from a Scorsese movie: more steam pluming from the grates on the corner of Liberty and Broadway, a plump and devilish photographer staring rabidly at his recently snapped images with a cigarette undulating up and down in his mouth like some phallic fount and backlighted by the harsh gleam of a TV news camera. In fact, the more these media types were concerned with image, the bigger their waistlines tended to be. It was almost as their cameras badgered their torsos into requiring more space. I chalked this up to raw nerves. What the protester didn’t know was that in a few hours, the collective hope would be vindicated. For now, more blue boys had arrived at Broadway. The human microphone system had adjusted itself to the city’s noise code. But when it came time to respond with jubilation, the protesters lived up to the bargain. There was a Superman and two Captain Americas in the crowd. I wondered if there was some crossover between Occupy Wall Street and New York Comic Con. I had obtained press credentials for the latter many months before, but I had decided to blow it off. It seemed superficial in light of recent developments. One Captain America told me that he was tempted to go on Sunday when the tickets were cheaper. But it was clear that Zuccotti needed more superheroes than Jacob Javits. And the superheroes I observed – even the ones with Alan Moore’s Guy Fawkes homage – didn’t really need costumes. It wasn’t a surprised that their masks stayed mostly off. I saw a kid peacefully sleeping on the perch on the park’s western corner and, vexed by what was set to go down in less than an hour, I became very protective. But he woke up and I was relieved. I walked back to Broadway and I stole wifi from McDonald’s. While snickering over this strange irony, I saw a guy trying to pick a fight. Something about twelve hundred dollars, one guy bopped on the nose. The NYPD stepped in and issued citations. The protesters urged those surrounding this duo to stay calm and nonviolent. This was to be a running theme of the morning. People who wear T-shirts and who have a week’s worth of stubble (my mien on Friday) get different answers from protesters than people who wear ties. Even so, the protesters had been here long enough to employ caution. After two weeks, you had to be an old timer to get any bites. And I had only been at Zuccotti about seven times. So I spent most of the time just observing. Still, the protesters were kind. Two asked how I was doing, perhaps sussing me out. A hearty man who identified himself as Keeper of the Trail Mix offered me a generous portion. Two men circled the perimeter swinging incense. There was a peaceful ding from a bell. “Good morning. Good morning. Spread the love.” DING! “Good morning. Good morning. Spread the love.” Ginsberg’s “oms” would not have been out of place. Then, with less than an hour to go before the 7AM showdown, the blue boys began clearing the sidewalk on Zuccotti’s Broadway edge. But this precious isthmus between the edge of the protesters and the cops, tricky to negotiate on scant sleep, narrowed. 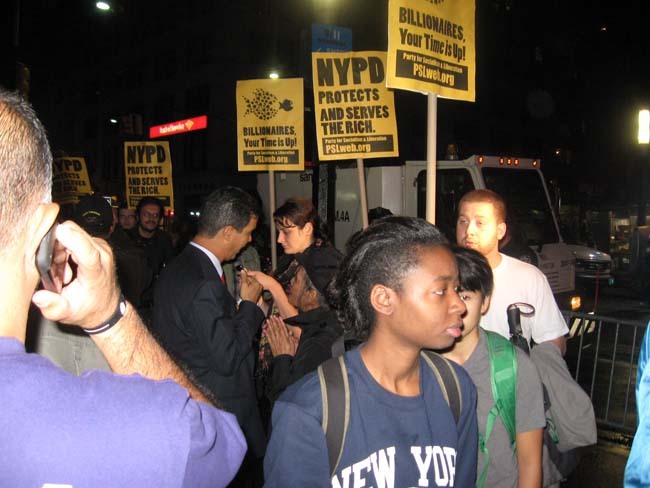 And it thinned further when the union men came in with pickets decrying the NYPD standing up only for the rich. “I’m trying to move!” shouted a burly man at a cop as the throngs thickened. “Don’t push me!” I hoped it wasn’t a harbinger of things to come. I squeezed in and out of the mass; it now took about five minutes to wade through the pea soup of a crowd. I noticed that the cops had formed phalanx positions at the two open corners of Broadway. But revolutionary talk stayed strong. “We….are….the 99%!” shouted the crowd. I watched two empty NYPD buses shuttle down Broadway. The crowd remained very confident, but I did notice workers squeezing in between the cops and the barricades and wondered what was up. Then word arrived that the Zuccotti cleanup would be delayed and there were cries and cheers. I hadn’t been quite sure of the news, in part because it seemed anticlimactic, but another man confirmed it. And the promise of a new plan, intimated by the double-layered trickle of repetition only minutes before, had come to fruition. But what to do? “All week, all day, marching down Broadway!” shouted some people. There was a guy with a whistle. But for some reason this pledge didn’t catch on. There was still a tremendous cluster in Zuccotti. As the daylight arrived, I somehow caught on to this two step gambit and followed the group, finding myself near the head of the march. Then there was a call to march on Wall Street – a celebratory response to recent developments. And the people with whistles piped in time to “Whose street? / Our street!” At first, they walked slow. A smiling woman stood atop a trash can, shaking her fist in unison to the chant. I liked her a lot. Another woman raised her open pink umbrella into the sky. I liked her a lot too. We were close to Bowling Green Park. I saw the two empty police buses that I had noticed earlier parked to the right. I was troubled by the police presence at the other end, which was close to the Charging Bull (protected by the same grille barricades used at Zuccotti). Were they leading us into a trap similar to the Brooklyn Bridge? Judging by the number of bandanas over various mouths, the other protesters had the same worry. If I had to be pepper spayed, so be it. 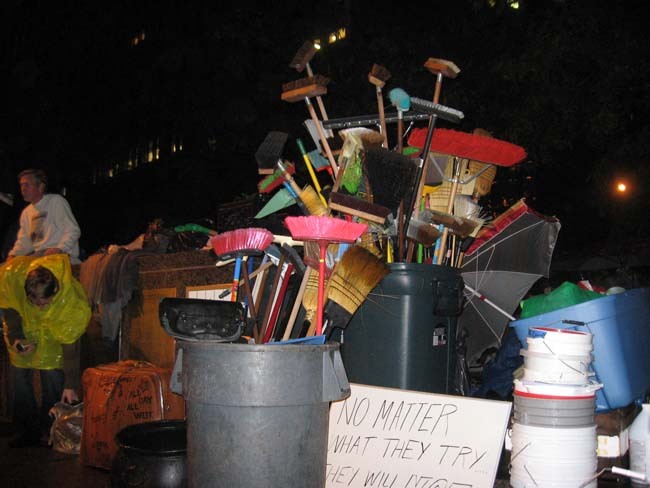 At the head of the march, many protesters had taken the brooms from Zuccotti, sweeping them along the surface of Broadway. It was a perfect protest metaphor. Then the march rounded a corner towards New Street, with many protesters hopping a diagonally raised platform. “Banks got bailed out! / We got sold out!” A normal-looking guy, around my age and close to my male pattern baldness (I like to look out for my fellow balding members) and wearing a blue T-shirt, held a simple sign reading SAVE THE MIDDLE CLASS, with two humble red stars. He stood out from the others, and I wondered if he was part of the fresh influx that MoveOn had called upon. But then the crowd began to run, for reasons unknown. At first, I thought it was general euphoria. But there seemed a genuine rush to run down the street, followed by protesters chanting “Walk! Walk!” to prevent any problems. And then we reached a new set of barriers, with a few white shirts and boys in blue. And I wondered again if we were being deliberately trapped. Being near the head of the group, I walked along the length of the barricades with the other protesters, bathed in the red neon light of freshly opened cafes to my right. And at the other end, there were several police mounted on horseback. White shirts commanded me to move on the sidewalk. “Keep walking,” they shouted. I ambled around in a slight daze. Somehow I ended up in the middle of the street, away from the barricades. I looked up and saw several horses headed my direction, with one mounted cop looking directly my way. Not really knowing the protocol for how mounted policemen contend with guys drifting into the street, I felt the best course of action was to keep walking down Broad Street. Surely the other protesters would be behind me. They were not. It looked as if the NYPD were closing the protesters in. I somehow ended up in a Starbucks on Broad and Beaver, where the sight of mild-mannered white collar workers, many of them miserable, grabbing lattes before work proved a strange contrast to the recent excitement. I stole wifi from this Starbucks, as is my wont with a Starbucks, and attempted to consult Twitter to find out what the hell was going on. The signal was intermittent. I was only able to send tweets. So I returned to the streets, where I saw cops approaching with white ties dangling on their belts moving down Beaver. I had asked a few people if there were any arrests. They said that there weren’t. But the great irony is that, only a few minutes later, after I was trying to find the march again, five people would be arrested at the very corner where I had just found refuge. I did manage to pick up one part of the march again, greatly enjoying someone who had gone to the trouble of dressing in a shark costume, top half covered by giant jaws. The march turned left again on New Street, following the same pattern as before. I intercepted the march again when it headed down Beaver. There was a great roar of beeps from the cars moving in the other direction. I was to hear Wall Street workers grumble disapprovingly about traffic. 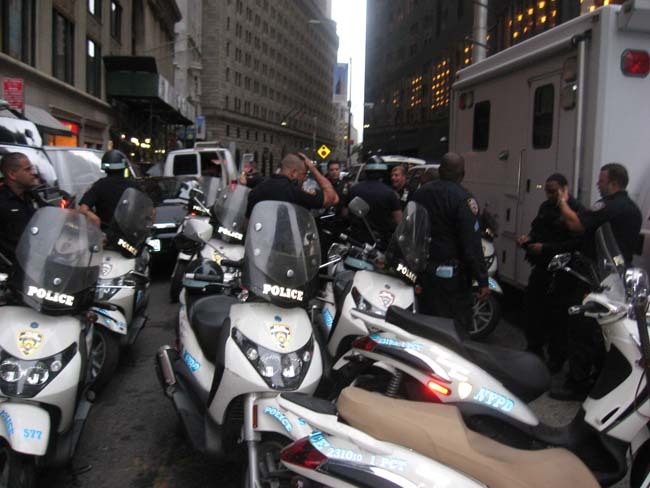 But then there were about five NYPD scooters that pushed forward against this traffic in the street. Not quite Corman’s The Wild Angels in reverse, but I was still curious. At first, they appeared to be amicably following the protesters on their march. But I was later to see that some on these scooters were trying to intimidate protesters. I was relatively safe, somehow scooped up with all the video cameras that were following the angry red rear lights. In the distance, I saw one protester stand in front of the scooters, pacing back slowly. Then a scooter roared inches past me to my right. (Later in the morning, one of these scooters would run over a protester’s foot.) The protesters ran again. I saw a white shirt run into the street, his hand reaching to his belt, and I didn’t know if he was going to raise hell. So I pointed my camera at him and started filming. He saw my camera and then beat a retreat forward. And then something amazing happened. An entire circle of protesters surrounded the scooters. They shouted, “The whole world is watching!” Behind us, a band arrived, composed of drums, horns, and flutes, and all dressed in green shirts. In the mad rush, I didn’t catch what group this was. But I appreciated their peppy offerings. And I wasn’t alone. There was a guy with a thatchy green scarf around his neck and a burgundy sweater who was clapping his hands and swaying his body to the music. He was nodding his head at his friends and smiling wide. A witness later told me that five people had been arrested at Broad and Beaver. I decided to track back and noticed that there was a huge police presence moving down Broad – perhaps sixty cops. I decided to follow them. But when the last cop made it past the barricade, they closed the opening behind them. So much for my stealth tactic. I decided the best option was to return back to Zuccotti. The mood there had not been broken, but the police presence remained strong. When I walked past Wall Street and saw a barricade manned by several police, with a few cops checking the IDs for all employees walking through, this was a dispiriting sight, like unexpectedly setting foot into an old Eastern European country. I decided that I had dodged enough arrests and barricades for one day. It was Friday morning and it wasn’t over for the protesters. I headed home to grab a few hours of sleep. Live in NYC long enough, it becomes a small village. Re: Zuccotti. I know him some from when he “served” on the VNSNY board (1 of 2 billionaire real estate families represented)when I was Board liaison there. He was a regular no-show to meetings, participated not at all in the committees he was assigned to, and made modest by any standard (but especially given his means) contributions to the annual fund. His absenteeism was tolerated because he had agreed to be “honored” at an annual gala a year or two hence and the agency (as they liked to refer to themselves) would have the opportunity to shake down his contacts for contributions so the CEO of this “nonprofit” could maintain her $800,000 plus annual salary. Ah, the gangs of New York. Ironically, his wife, an historian of the Holocaust (France and Italy) is someone I read in graduate school. Not her Vatican takedown of the Pope’s complicity with the Nazi genocide: “Under His Very Windows”, but an earlier one also about the Italian Holocaust–“Persecution, Rescue, and Survival”.